LANSING, Sept. 12, 2018 — In defiance of a 2016 federal consent order that calls for penalties of $500 a day for violations, members of the Lansing Rod and Gun Club have continued to fire lead bullets above and into Salmon Creek, a major tributary to Cayuga Lake. Hobby shooters have been doing so since the 1950s, pouring tons of lead shot into the creek over the decades in violation of state and federal law. But the U.S. Environmental Protection Agency hasn’t enforced its own consent order, and the state Department of Environmental Protection has declined to crack down despite cries from local residents. The controversy ramped up over Labor Day weekend after crews began clearing trees from gun club property in possible violation of local law — after the club withdrew its application in June for a town permit to do so. The town finally issued that order Sept. 11. The club sits on a sharp bend in Salmon Creek less than 1,000 feet upstream from a popular swimming hole at Ludlowville Falls, seven miles north of Ithaca. The creek empties into Cayuga Lake, less than two miles to the west. In September 2016, after local residents appealed the EPA to enforce the law, the agency entered into a legally binding consent order with the gun club. That order required the club either to stop all firing with lead shot within 180 days or to relocate its ranges away from Salmon Creek within 18 months. The club chose the second option, but the deadline for compliance passed in March. The club had taken steps late last year toward reorienting its trap shooting ranges by filing a site development plan application with the town. The club, which claims roughly 130 members, owns 113 acres in the wooded creekside valley. It operates a clubhouse and an outdoor pavilion with kitchen facilities suited to accommodate 400 people. It hosts community events like pancake breakfasts and horseshoe contests. It is generally more oriented toward shooting than fishing. Nicholson, who holds a Ph.D and serves as president of Sustainable Tompkins, has calculated that club members fire up to 3.5 tons of lead a year toward the creek and marshlands. She based her figure on the club’s estimate of 100,000 rounds fired annually and the weight of a typical trap shell. Studies have found that lead left to mix with soil at gun ranges may pose very serious hazards. The club has not been inclined to replace lead shells with steel rounds or install so-called “shot curtains” intended to keep lead from mixing with soil, but it has expressed a willingness to address lead contamination. — Re-orient shooting fields to avoid shooting over and into water and wetlands. — Maintain soil pH between 6.5 and 8.5 in the shot-fall zone. But the club has never attempted to recover fallen lead over its seven-decade existence, even after releasing its stewardship plan. And efforts to reorient the ranges took a radical turn in June when the club’s law firm declared that the club was withdrawing its site plan application on the grounds that it was exempt — grandfathered — from local zoning law enacted after the founding of the club in 1955. 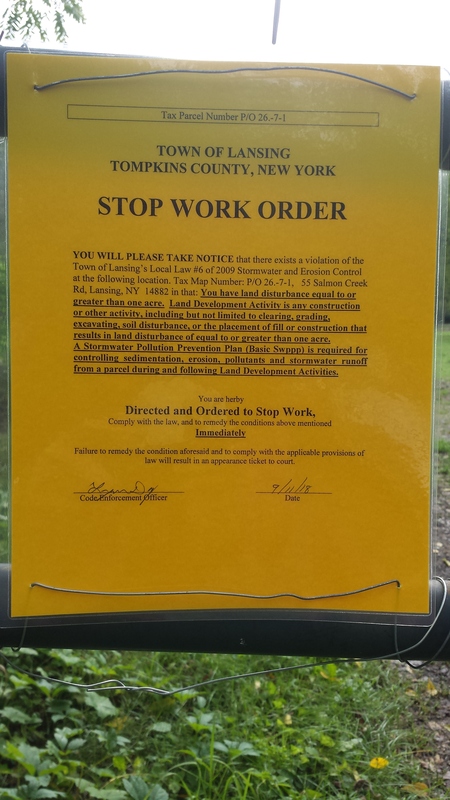 “No town permits or approvals, including a special use permit or site plan approval, are needed to allow the club to enjoy continued, unmolested use as-is,” Andrew Leja, a Syracuse partner at Barclay Damon LLC, wrote the Lansing Planning Board on June 20. That stance leaves Lisa Ruzicka, a gun club neighbor, in a precarious position. She wonders whether she should try to sell her home now, or simply quit raising vegetables in her garden. One map filed with the aborted site plan application shows a new rifle range extending over a hill that rises immediately behind Ruzicka’s back porch and property line. While she can’t predict whether the club will follow through on the plan outlined on the map, she’s fretful that it has declared its unfettered right to do whatever it chooses. Lead, even in low doses, harms the brain and the nervous system, especially in children. The federal government has banned its use in gasoline and paint, but in August 2010 it rejected a petition for a ban on lead shot and bullets. “Health effects from lead exposure can run the gamut from acute, paralytic poisoning and seizures to subtle, long­-term mental impairment, miscarriage and impotence. Lead is a cumulative metabolic poison affecting a large number of biological functions including reproduction, growth, development, behavior and survival. Less than three months after refusing to ban lead shot and bullets, the EPA also declined to impose a national ban on all “lead fishing gear,” including sinkers. In the case of the Lansing Rod and Gun Club, the EPA hasn’t moved to enforce the conditions it imposed in the September 2016 consent order. Town officials have said they don’t even know for sure whether the EPA has granted the gun club an extension on that agreement. But a DEC official recently shed some light on the EPA’s stance. But Marko did not commit the DEC to active enforcement. Meanwhile, the town sent letters on Sept. 10 to the DEC and the EPA notifying the agencies that the gun club’s recent clearing activities at the site violated rules requiring a stormwater permit for disturbances involving more than one acre. Phone calls to the gun club office and Barclay Damon were not returned. Hicks and Barclay Damon partners Andrew Leja and Michael Oropallo, the gun club’s lead attorney, did not respond to emailed questions. Thank you Peter Mantius for this great summary of the battle we’ve been in for several years with the gun club hobbyists poisoning our air and water. Great article explaining the history of the gun club and thier contiuned lack of consideration for the environment and anyone but themselves. Thank you so much for getting this story out. I am a Dryden resident and wish to direct a comment to members of the Lansing Rod and Gun Club. From a watershed standpoint, I live somewhat ‘upstream’ of Lansing and Ludlowville. In this upstream capacity, if I were to put a large and lethal load of something into your water and soil, you would rightly take issue. If my actions lowered the resale value of your land or gave new families pause about moving here, you would resent it. If my actions jeopardized your trout habitat and the chemistry of our shared lake, you would surely object. Understandably, you would pursue legal means to stop me or find a truly win-win compromise. My point is no doubt clear. You are in fact me. Local families are at your mercy and are showing deep concern over your actions. And you have cost-saving alternatives to the core problem at hand: lead shot. Isn’t community mutual respect, safety, and unity worth more than the right to do the same-old thing, as if alternatives didn’t exist? You can wave off a resident from a neighboring town, but you can’t wave off your immediate neighbors. The LR&GC website calls its members “concerned conservationists” who “take conservation seriously.” Now’s your chance. Your good will will be long remembered and much appreciated.